We have access to a network of highly trained Student Brand Managers across the UK with a presence at over 100 University campuses. Student Brand Managers or Student Brand Ambassadors are fantastic for providing third party credibility to brands. It also allows brands to reach a wider audience of potential customers through peer to peer exposure. By bringing personality and a human face to your brand, students can identify with the product or service that you are advertising on a much higher level. Student Brand Managers are perfect for promoting a new product or service, or simply generating brand awareness. BAM have a dedicated and experienced team in house who can help you run a successful Student Brand Manager campaign whatever the size and scope. With the addition of our Student Brand Manager Portal we can help recruit the perfect candidates, set engaging missions, see results in real time and manage your Student Brand Managers remotely. 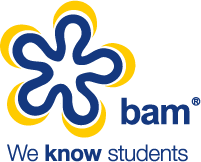 BAM are experts in helping brands implement effective Student Brand Manager and Student Brand Ambassador campaigns.